How do I create a shortcut to a specific content item, such as an assignment, discussion forum, test, and so forth? The Create Internal Link feature allows you to create a shortcut link to any content item within this site. For example, you can place a link to a discussion forum or quiz right after lecture notes. This feature allows you to easily refer to common items, such as the syllabus, from different areas of your site. Step 1: In the left-hand site menu, click the name of the content area which will contain this link. Step 2: Decide where to add the link: on the main page of the content area or inside a folder or sub-folder. 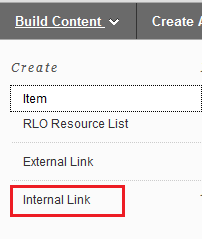 Step 3: Mouse over the Build Content button, then choose Internal Link. Step 4: On the Create Internal Link page, at a minimum enter a Name and Browse to find the link. Advanced options on this page are described at the end of this article.